All Hallowed Kitties (aka Thunder’s Cuff). 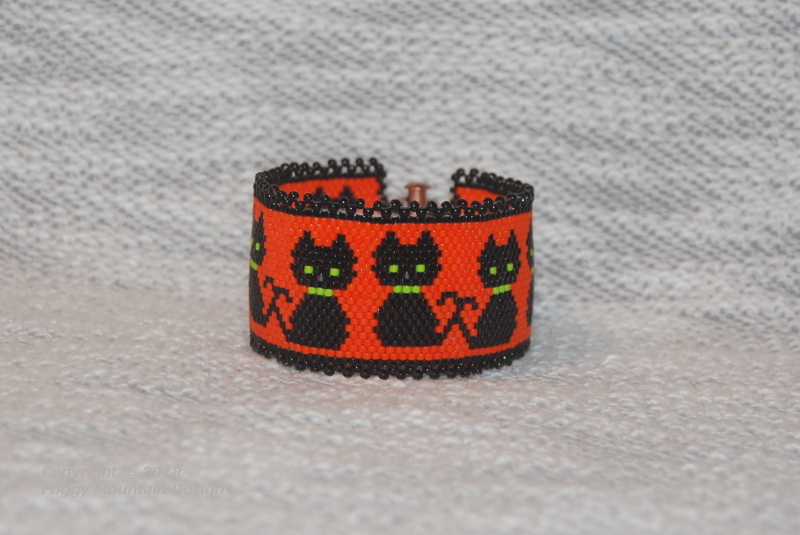 In spite of one obstacle after another, my brick stitch black cats are finished before Halloween! 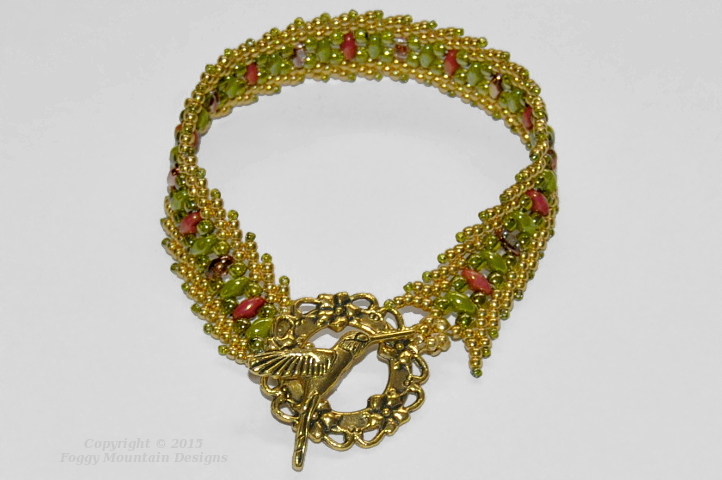 Every month Nancy Dale at NEDbeads has a beading prompt. The August prompt was spirals and I managed to finish mine on the last day. This is a (modified) Dutch Spiral rope turned into a bracelet. 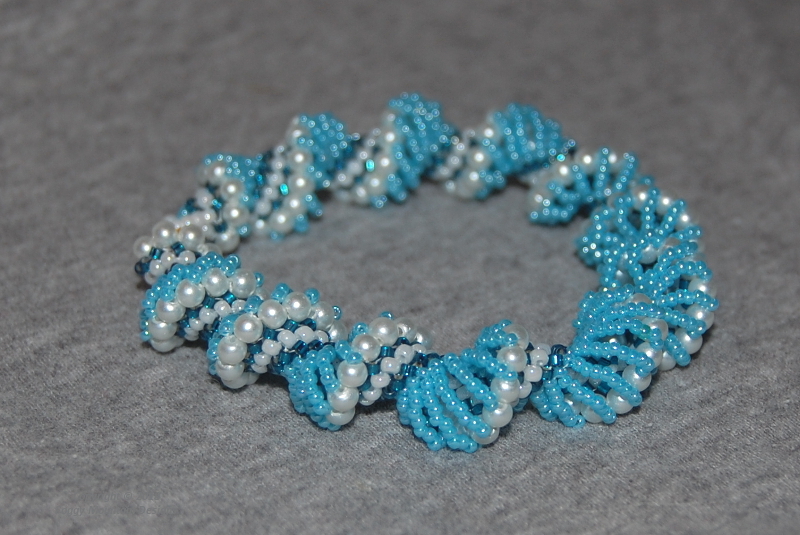 This is one of my favorite stitches but I’ve always thought of it as a beads version of a bad-hair-day when photographed. Here is my entry for the OTTBS September Flash Challenge. All stash (15’s and 3mm) – dainty and very sparkly. I used Ny Wetmore’s instructions that I had stashed in one of my tutorial notebooks. 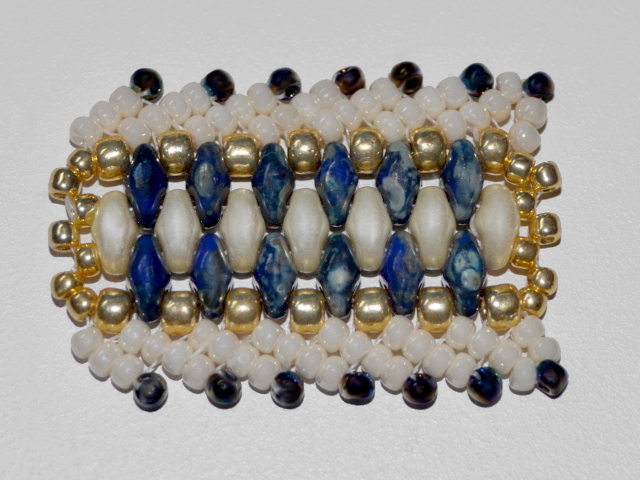 The white specks on the 3mm beads aren’t seams, they’re light reflections from the grape lined seed beads. Designed by Beth Clark at Beading by Beth, stitched by me. (The fingers are back!) 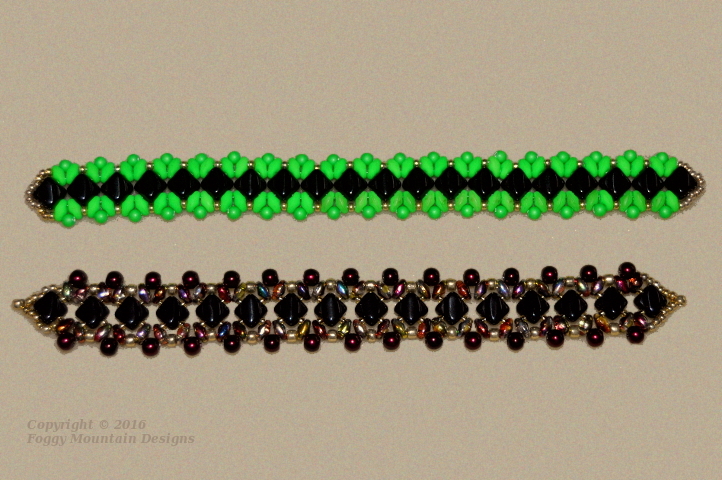 The whole time I was working on the black/neon green, I kept thinking it looked like flowers on the edges. If only I had some 3mm pink rounds! I modified the bottom bracelet by adding 15 between the Silkys and Duos. Now to add some clasps. 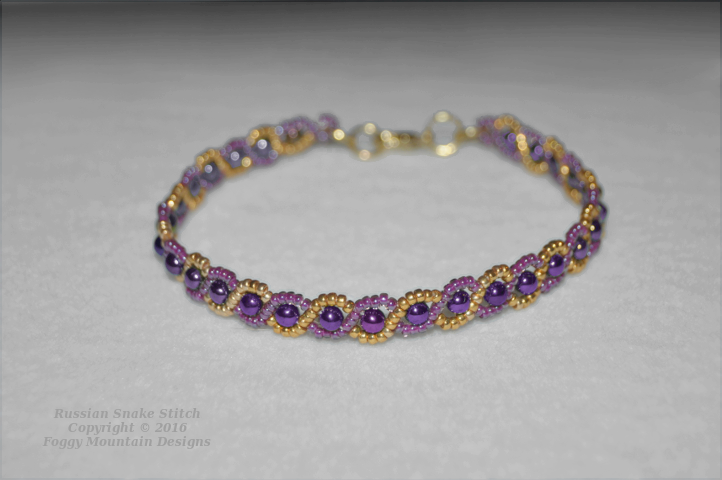 While this bracelet is the same stitch as the previous ones, I added five size 15 seed beads for the turn-around at the ends of the rows. It’s still on the mat waiting for me to choose a clasp. I’ve moved from Herringbone to a new design using St. Petersburg stitch (although it looks like a double St. Pete, it is really two singles) with duos. 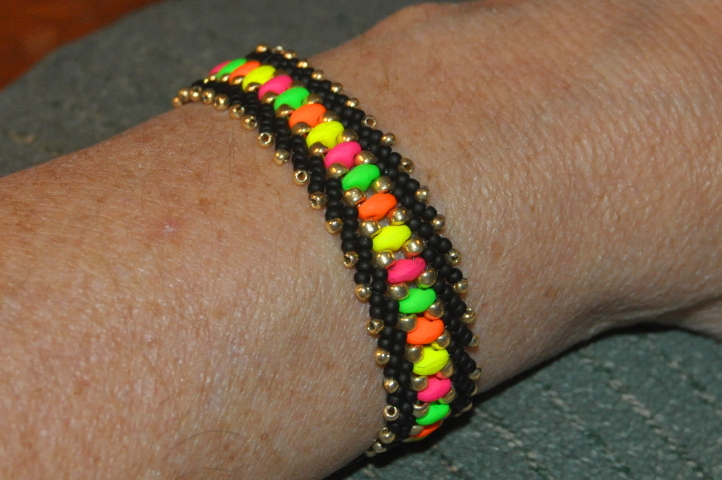 The middle bracelet has neon duos and black twins. Depending on how you finish the ends, almost any clasp will work. My friend Lela gave me the hummingbird clasp a while ago. I think it fits perfectly with this bracelet. Finished with a lobster claw. 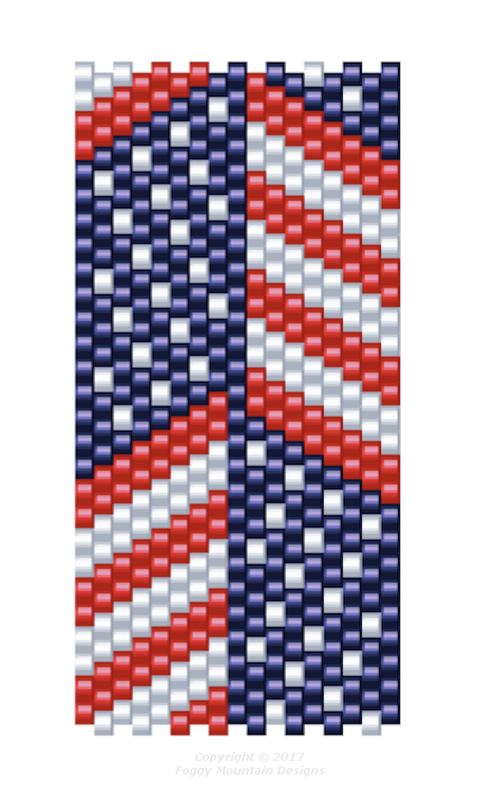 Here’s a test strip to show how I finished the ends on the multi-duo-rows to add a 3-strand clasp. I don’t know if I’ll write a full tutorial for it or not. If you want to give it a try, it’s very simple. You will need the following materials. 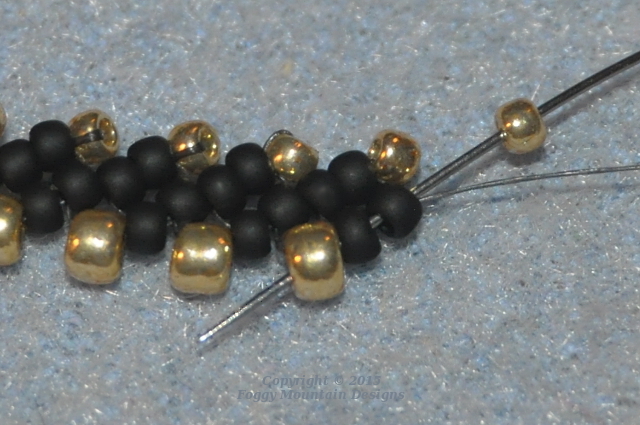 Size 15 round seed beads (or size 11) for the top turning (tips) bead. 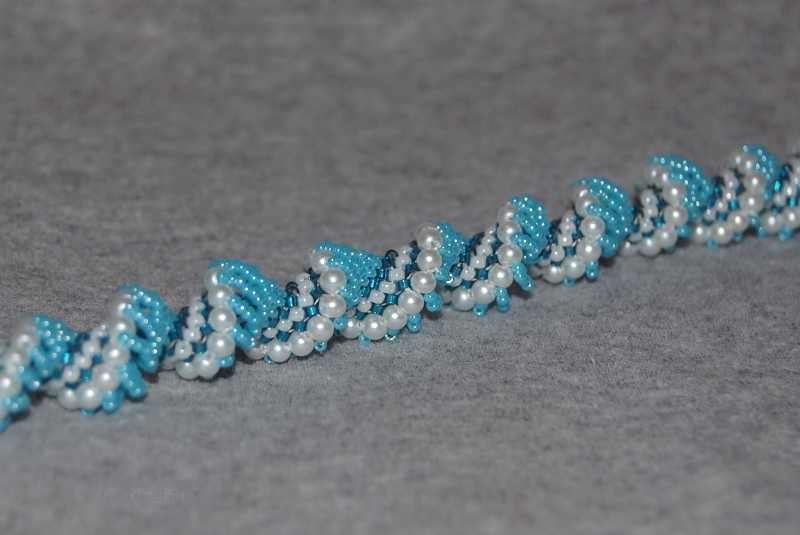 You have to have an even number of size 8’s (all of my seed beads were Toho) for each piece of St. Pete. Very small wrist: 36 (72 total) – size 8 (35 duos for single row). Small/med wrist: 38 (76 total) – size 8 (37 duos for single row). Large wrist: 40-42 (80-84 total) – size 8 (39-41 duos for single row). Peyote a row of duos between the 8’s. Make your second strip of St. Pete stitch, repeat the turn-around, as above, and zip the new strip to the un-stitched side of the duos. I’ll leave it up to you to decide how to add your clasp and you’re all done! As always, if you do decide to make it, please give credit. And I would love to see your photos!